Microsoft has published a usefull best practices document about this topic. Take your time to read and understand it. It can improve your performance of your disks up to 30% depending on your storage configuration. 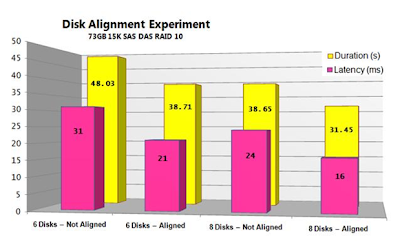 Within my company Exact we have seen a performance improvement of 10% with aligned partitions on a HP EVA 5000 storage system. The good news is that partition alignment is simple to perform; The bad news is that partition alignment must be done at partition creation time, prior to partitions being formatted. This is great if you have a new SAN, but it might be painful to convert large amounts of existing data on misaligned partitions. Correct disk partition alignment is done by default on Windows Server 2008. On prior versions of Windows Server partitions are misaligned by default.